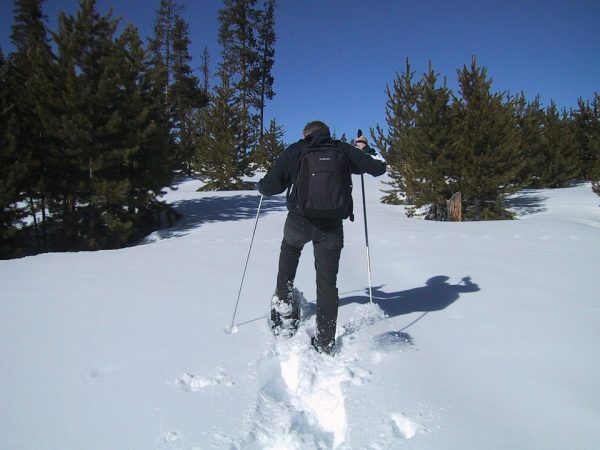 Snowshoeing can be a great way to explore a winter landscape. It’s been around for decades and you can actually find outdoor retailers that offer lessons with rented equipment if you don’t have your own. Even if it might be completely winter yet, it’s never too early to plan ahead. If you’re looking for a place to play in some powder there this winter, here are five of the top snowshoeing destinations in the United States. Most people wouldn’t think a southwestern state like New Mexico is a solid snowshoeing location, but venture far enough into the northern regions of the state and you’ll find a ton of snow just waiting for you. In fact, you can find enough snow pretty close to big cities like Albuquerque, close to several trails within the Sandia Mountains. You can even take an air tram to the Sandia Crest and snowshoe down to the base of the mountain. A common location for tourists during the warmer seasons, due to the attraction of Mount Rushmore, the Black Hills can also be a great snowshoeing destination during the winter. The region is home to Custer State Park, which spreads for thousands of acres and is a well-known spot for sighting buffalo, elk and other majestic wildlife. Bonus Tip: Bucket List outdoorsmen will want to check out the Centennial Trail, which starts at Bear Butte Lake and stretches to Wind Cave National Park. One of my favorite places in the U.S., Michigan’s Upper Peninsula is where many Michiganders head for fun in the snow and a retreat from the fast-paced hustle and bustle of Lower Peninsula life. The U.P. is also home to one of the best places to snowshoe: the Porcupine Mountains Wilderness State Park, which is spread along Lake Superior and features over 100 miles of trails ready for your snowshoes. Don’t forget to ascend the rocky trails to snag a breathtaking view of Lake in the Clouds nestled within the mountains. Part of the Green Mountain State Forest, the Stowe Mountain region of Vermont is home to over 100 miles of trails and has served as a popular destination for families looking for a snowy vacation. Beginners staying that the resort lodge can actually take a guided snowshoeing tour to take in views of Mount Mansfield. The resort town offers several rental spots for those looking to try their hand at snowshoeing and you can even snowshoes down Main Street for a bit of snowy window shopping. Rounding out our list is the Apostle Islands National Lakeshore in Wisconsin. This shoreline landscape offers outdoorsmen beautiful hikes and views year-round, but blanketed in fresh snow it becomes a serene, surreal escape for destination snowshoeing, due to some of the natural structures you’ll encounter. Check out the route from the Meyers Beach that runs along the Lakeshore Trail for two miles, where you’ll experience caves adorned with massive, shimmering icicles.